Tonight we started our first limited-palette color painting of a live model. Rather than turning us loose on the task, Jennifer worked with us mixing the color/tonal blends systematically on our palettes as we had observed her working last week. I was glad she took this approach, as this part is exceedingly complex, and I didn’t remember all her instructions from last week. This particular teaching technique had Jennifer standing with her art gear in the center of the semicircle of students standing with their art gear. The open half of the semicircle faced the modeling stand and the model. Jennifer mixed her palette and talked constantly while the students mixed their own palettes. Occasionally a student or two would walk forward with a bit of paint on a palette knife and compare their paint to the color and value that Jennifer had mixed on her palette. It seemed that Jennifer was subtly helping us overcome the fear of starting, of making something new. Fear of beginning is something common to most creatives, or people driven to create. The syndrome, or complex, is known among writers as writer’s block, but it afflicts artists of every type as well. The problem it creates is serious and subtle and amounts to artistic suicidal tendencies. These are the thoughts and feelings of futility that the emerging vision cannot come forth. The syndrome also includes the worry that the artistic result, birthed by dint of talent and hard work, cannot possibly match the original vision or conception. Thus, the mediocre product exposes the artist’s lack of talent and his or her actual existence as an impostor. Here is the tiny, evil gremlin that drills through the back of the cranium and sets up shop in the cerebral cortex. It is both the fear of failure and the fear of success. Many people with some talent have turned away from any artistic endeavors due to this fear, hence artistic suicide. But getting through the complexities of limited palette mixing does not produce a product, or even the beginnings of a product, so any fear is circumvented. I’ll go out on a limb and say that the inner child (not the gremlin) of everyone who goes into painting loves to play with color—from toy blocks and finger paint and crayons to water colors and acrylics and oils and computer graphics. So the entire class had great fun learning from Jennifer how to play with color. I know I did. 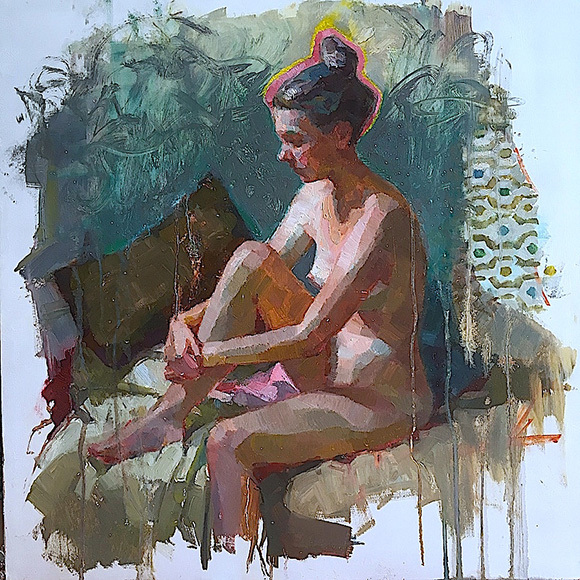 In the second half of the class, everyone, including Jennifer, accomplished a figurative painting, applying the techniques of value painting learned in the first half of the course. The class worked with bold strokes and commitment amid uninhibited chit-chat. The gremlin was thwarted, at least for a while.